When President George W. Bush uttered the phrase "Axis of Evil" in his 2002 State of the Union address, his words were aimed squarely at Iran, Iraq and North Korea. North Korea's foreign minister fired back, saying those provocative words were "a little short of declaring a war." Iran's supreme leader, Ayatollah Ali Khamenei, said his country was "honored to be the target of wrath and anger of the most hated Satan in the world." And Iraq's vice president called Bush's statement, simply, "stupid." In 2010, in an attempt to change the conversation with and about those who would be enemies of the United States, artists and Pennsylvania natives Jon Rubin and Dawn Weleski turned to that greatest diplomat: food. They opened a takeout place (or art project, depending on how you want to look at it) in Pittsburgh called Conflict Kitchen. Every six months they would pick a country the U.S. is in conflict with and serve up street food from that country, along with a side of political discourse. "The food was really confusing at first," Rubin says. There weren't many ethnic food options in Pittsburgh. But he says, "We were serving street food, stuff that wouldn't be too hard to get your mind around." Rubin and Weleski started with Iran. They called it Kubideh Kitchen, after a dish of spiced beef wrapped in barbari bread and flavored with basil and mint, onions and sumac. Persians from all around Pittsburgh made the pilgrimage to their counter. "The Persians were super excited because there had never been a Persian restaurant in the city. I think they were also excited about the larger idea of the project." That is, opening the political discourse. "In one way or another, they've experienced the perceptions that Americans have about Iran." They also hosted events, including dinner parties with a table that virtually extended to Tehran via Skype -- a screen at the end of each dining table connected the two simultaneous dinners. The look of the restaurant is bold. 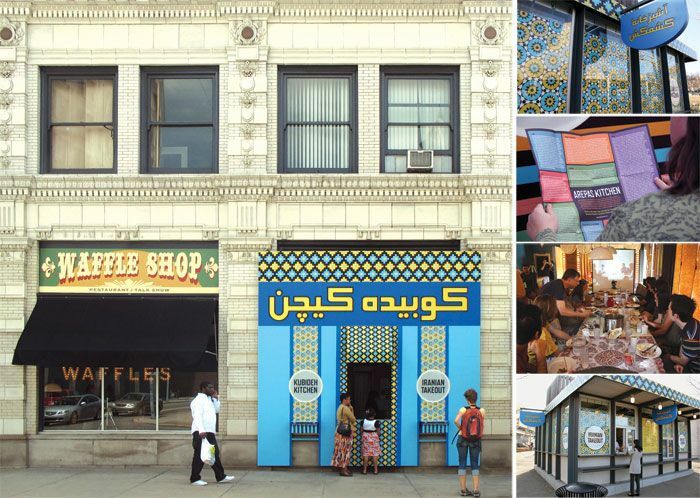 Shocks of color and pattern and typography, with words in Farsi or Dari or Spanish. The fanciful wrappers the food comes in carry messages from citizens of the country of focus as well as expats. Their graphic designer, Brett Yasko, who also works for MASS MoCA, creates a sophisticated look inspired by carpet designs from Afghanistan or woven tapestries from Venezuela. "We don't want to exoticize," Rubin says. "We also don't want to bore." It worked. 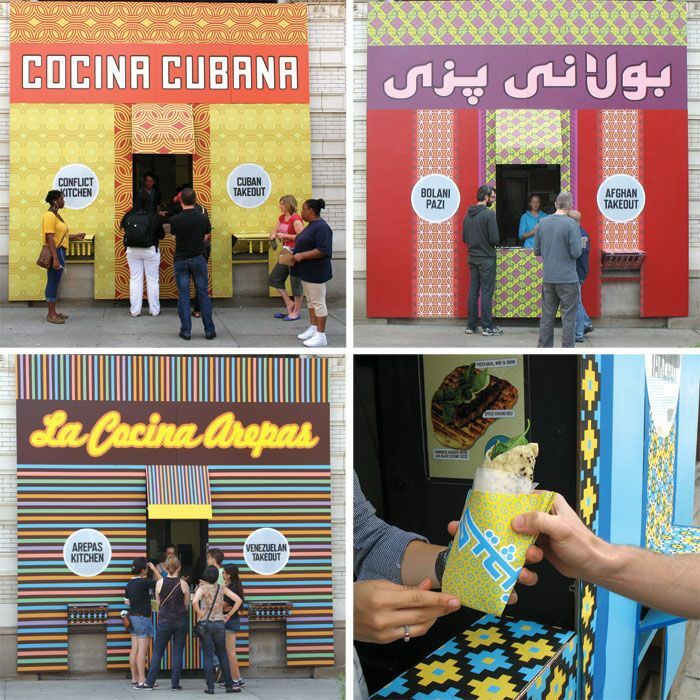 After Iran, Conflict Kitchen did Afghanistan, serving turnovers with various fillings. Then, Venezuela, serving up arepas, a corn cake filled with meat and vegetables. Then Cuba. People came. And ate. And talked, and learned. And then, the place closed. "The lease was up," says Rubin. So they hosted a Cuban-style weekly restaurant at a friend's house for six months until they found a new larger location about two miles away from the original. They reopened in April with an expanded Iranian menu that includes stews (called khoresht) as well as desserts, which they will serve until the Iranian elections take place in June. Business was so good the first week that they were running out of food, the line was 20 people long and they needed to double their staff. "It's interesting," Rubin says, "to have an art project with a fan base." And while there's no definite decision for what's next on the menu at Conflict Kitchen, Rubin has been preparing for an event this month at the Headlands Center for the Arts in Sausalito, California by studying up on North Korean cuisine.